I've grown about a dozen basil varieties, from culinary sweet basils like 'Genovese' and 'Mexican Cinnamon' to Indian Holy Basils like Vana Tulsi. Each variety of basil is distinct–visually, aromatically, and on the palate. The two main types of basil are the Culinary (Sweet) Basils, and medicinal basils like Holy Basil. All are warm-weather herbs that are easy to grow in pots, and thrive on sun and heat. 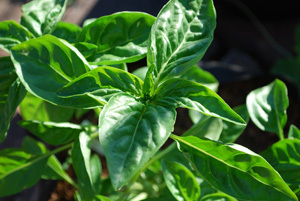 For information on Growing Basil, click Here. 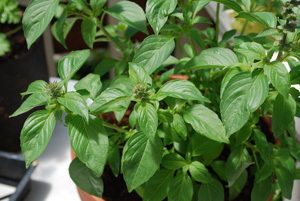 Basil arose in tropical and subtropical Asia, where it is often a small perennial shrub. In the northern hemisphere, it’s grown as an annual. There are dozens of culinary (sweet) basil varieties, from lettuce-leafed varieties with huge leaves, to tiny and delicate “mini-basils”, bred for growing in pots. Flavors range from the citrus hints of lemon basil to the anise of Thai basil and the peppery spiciness of Mexican cinnamon basil. Links to buy seeds go to seed companies that offer that variety. We are affiliates of Seeds Now and Burpee Seeds. We receive a commission on seed orders you place to these companies (the commission comes from the company, so you pay the same whether you click on our link or order directly from the company). Commissions help pay for maintaining and updating this web site. Links open in new windows. 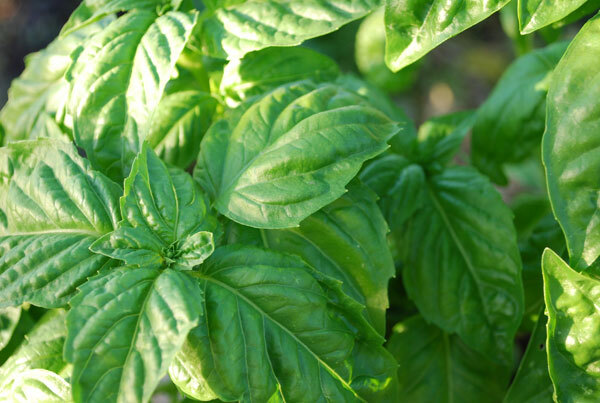 ‘Genovese’ Basil is the large-leafed, green basil you see in stores, the kind most frequently used for pesto. Vigorous plants grow to 24” (61 cm) tall, with a crown spreading 20” (51 cm). ‘Italian Large-Leaf’ (‘Napolitano’) Basil has very large leaves, and is also popular for pesto. A little less peppery than Genovese basils. Grows to 20" (50 cm) tall, with a crown spreading 18" (46 cm). ‘Mexican Cinnamon’ Basil is my favorite basil. In a deep-dug bed, the plants grow about 18” (46 cm) high and as wide. The leaves are half the size of Genovese basils, but have a pronounced peppery cinnamon flavor. The stems and flower bracts range from pink to a rich, deep purple, with pale purple flowers. A striking plant in any edible landscape. ‘Mrs. Burns’ Lemon’ Basil is another favorite, with a pronounced lemony taste, like a toned-down lemon verbena. The plants form a spreading dome 16-18” (41-46 cm) around. The leaves are also smaller than other varieties, usually about 1 1/2” (3.8 cm) long by 1" (2.5 cm) wide. Lemon basil makes an excellent addition to fish and shellfish dishes, and as a garnish in soups. ‘Lime’ Basil is very similar to lemon basil, except the leaves are a little larger and darker, and the flavor isn’t quite as bright. Flowers less vigorously than 'Mrs. Burns Lemon', so it holds better in pots. Great with fish or shellfish, especially scallops. ‘Siam Queen’ Thai Basil has a wonderful anise flavor that pairs so well with coconut milk in Thai cooking. The plants grow to about 18” (46 cm), with the crown spreading to 18-20” (46-51 cm). Its habit and color are similar to Mexican basil, but it produces more leaves. ‘Opal’ (Purple) Basil has bronzy purple leaves and dark purple stems. It’s grown for color as well as flavor. The lustrous purple leaves make a nice addition to a salad of light greens. 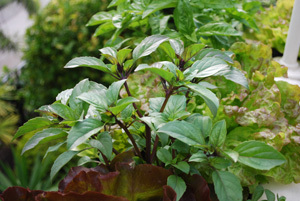 Opal basil grows well in containers, and makes a nice border plant in edible landscapes. 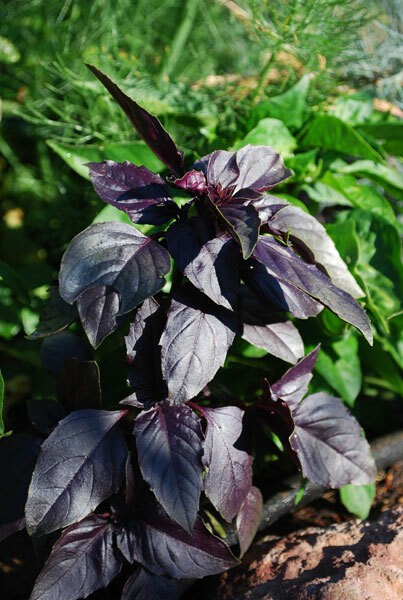 Greek Bush Basil (Ocimum minimum) is a mini-basil that forms 8-10” (20-25 cm) round globes. It has tiny, intensely-flavored leaves, but requires patience and manual dexterity to harvest. Krishna Tulsi, Rama Tulsi (Ocimum sanctum = O. tenuiflorum), and Vana Tulsi (Ocimum gratissimum) are the Holy Basils of India, revered for their clarifying effects on the mind. 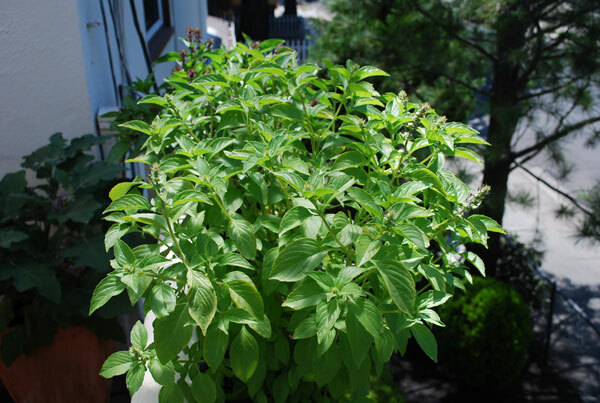 Holy Basil is planted in special Tulsi pots near the entrance to Indian homes, for its purifying influence. 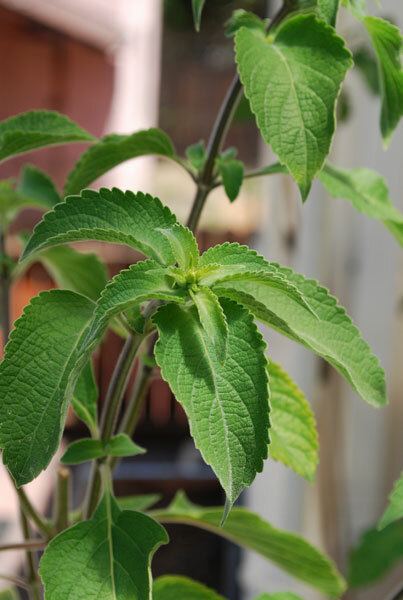 Holy basil has hints of clove, camphor, and cinnamon scent in the leaves and flowers. The leaves and flowers are brewed fresh, or dried and used for a delicious herbal tea that's mentally stimulating, without caffeine or caffeine-like effects. People nibble a few leaves as they pass the plant, but mostly, it's used for medicinal purposes, although it’s used occasionally as a spice in dals. Krishna and Rama tulsi grow about 18-20” (46-51 cm) high and as wide. Vana tulsi grows taller, up to 3’ (1 meter). All of the holy basils grow well in pots or window boxes. Rama Tulsi is probably the most common form of holy basil. The plant forms 14” (36 cm) domes of small, bluish-green leaves. The leaves have strong camphor and cinnamon notes. Krishna Tulsi needs strong summer heat to thrive. Has smaller leaves than rama tulsi, and reddish-purple stems. More peppery than rama tulsi. 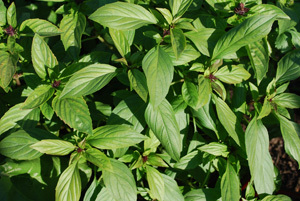 Vana Tulsi looks more like a mint than a basil. The plants grow to 3’ (1 meter), and have big, fuzzy leaves. Almost no fragrance to the leaves when crushed, unlike any other basil. Strong clove flavor when you bite into a leaf, even a little tingling on the tongue.